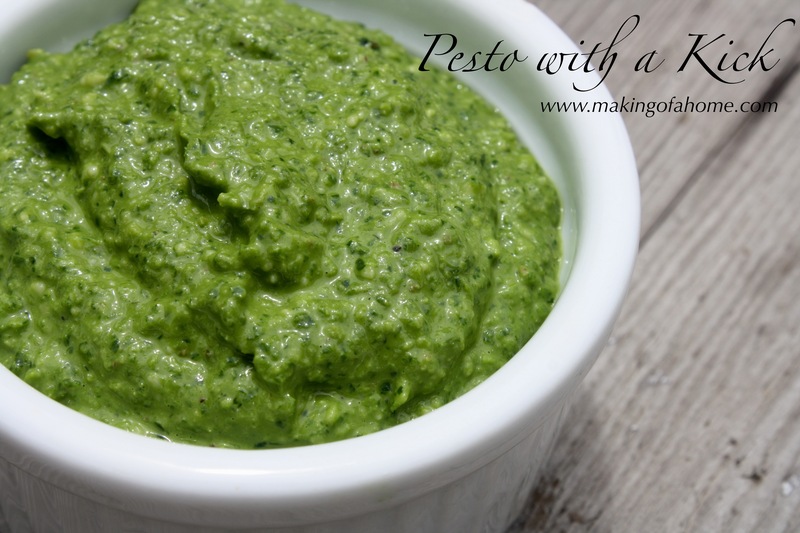 I love making pesto with early summer greens. It just makes me feel good. It’s green. It’s a great way to pack tons of vitamins and minerals in my kids’ bodies. And, there is cheese in it, and anything with cheese is a must have in my book. This recipe made a giant batch of pesto, so feel free to adjust as needed. You may also need to make it in batches, depending upon the size of your food processor. 1. Wash and spin dry (I adore my salad and berry spinner. Summer would not be the same without it. I use it Every. Single. Day.) 5 cups of kale and 3 cups of mustard greens. (Fyi…I jam packed the greens in the cups when measuring.) Set aside. 2. In a food processor, combine 1 cup raw walnuts and 6 cloves of garlic. Pulse them in the processor. 4. Slowly add in 1/2 cups olive oil while the food processor is running. 5. Add 1/2 pound good shredded Parmesan cheese to the food processor. 6. Slowly add an additional 1/2 cup to 1 cup of olive oil depending on the consistency you would like. 7. Add salt, pepper and lemon juice to taste. This entry was posted in Gardening, Holistic Living, Recipe, Sustainable Living and tagged DIY, eco friendly, farmer, farmer's market, food, food preservation, freezing, garden, gardening, gardens, growing, harvest, holistic, holistic living, home, homemade, homemaker, homemaking, kale, make, making, mama, mindfulness, mom, mother, mustard greens, organic, pesto, sustainable, sustainable living. Bookmark the permalink.